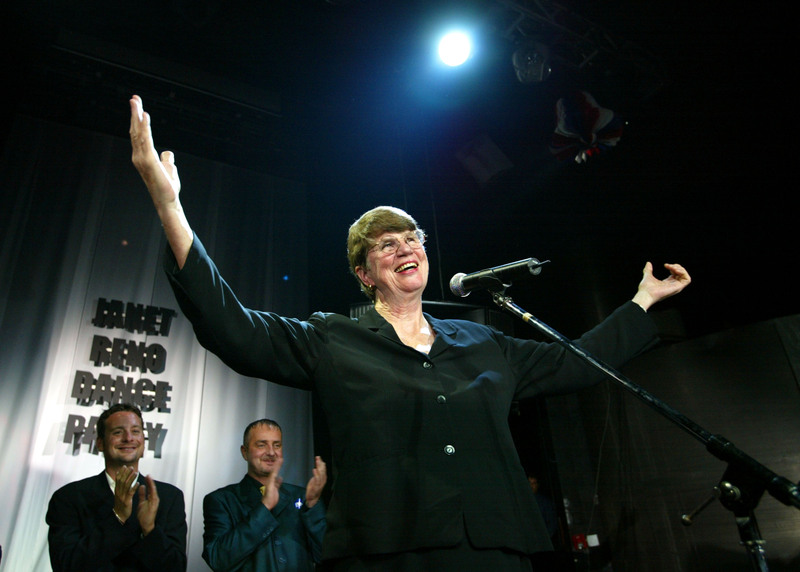 In a sad development Monday morning, the United States lost Janet Reno, the first female U.S. Attorney General — just one day before Hillary Clinton potentially becomes America's first woman to reach the presidency. Current Attorney General, Loretta Lynch, is the second woman to fill the position. Reno was a proponent of progressive values, including but not limited to: Abortion rights for women, tougher gun control laws, and eliminating sexual orientation of potential FBI employees as a relevant aspect to be investigated before hiring. For those who support those same causes, Reno's passing is a saddening blow, but I propose we try and celebrate her life by looking back at some of the happier moments. You might remember Will Ferrell's iconic impersonation of Reno on Saturday Night Live, where he portrayed her as a tough, dance-loving lawyer in the skits "Janet Reno Dance Party." While Ferrell's take on Reno was offensive to some, Reno herself seemed to find it funny, and even appeared on the show's 22nd season to participate in one of Ferrell's skits. Here are some of the best Reno-centric bits from SNL. Rudy Giuliani once held Attorney General aspirations, but instead he served as the mayor of New York City for seven years, ending on the same year Reno finished her term as AG. In this 1997 skit, Ferrell's Reno tries to get the real Giuliani to admit the jealousy he holds for Reno. It ends with Reno punching Giuliani, forcing him to repeatedly say, "Janet Reno is the boss of me!" Bill Clinton was a frequent figure in SNL's Reno skits. In this one, he shows up to praise Reno for having apparently been more relaxed than usual at one of his previous speeches and urging her to stay that way for his second term. Reno responds by throwing him out. Here we see The X-Files' FBI Special Agent Mulder meeting an "anonymous ally" who he believed had been sending him information about UFOs. Turns out it was just Janet sending him flirtatious messages. Classic case of miscommunication. Kevin Spacey plays Secretary of Health and Human Services Donna Shalala and dances with Ferrell's Reno. The best part of this skit, though, is Reno moshing with the teenagers around her and telling Bill Clinton to go away. The real Reno appeared in Ferrell's final skit impersonating her. She tells Ferrell-Janet that she likes her dress and ends with both Janets happily dancing.